When the Lamplighter Guild alumni found out about Mr. Hamby’s aspiration to record Titus: A Comrade of the Cross and Jessica’s Journey in March 2013, and the high cost at which the dramas were made, they were inspired to get together and brainstorm ways that they could help Lamplighter raise the funds to make the dramatic audios possible! Together, they came up with the idea to put all of their skills from the Lamplighter Guild about creating dramas together to create a dramatized audio book based off of the first story featured in Lamplighter Publishing’s The Vanished Note. Thus the project was born and in less than a month, The Vanished Note was created by a team of about ten Lamplighter Guild alumni. 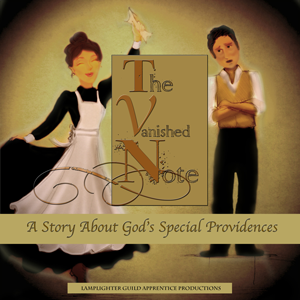 Based off of Lamplighter Publishing’s The Vanished Note by Mary E. Ropes, in Lamplighter Guild Apprentice Productions dramatized audio book The Vanished Note we are reminded that seemingly insignificant decisions can have a profound effect on others. Molly looks at the tempting bit of paper in her hand, realizing all she must forfeit in giving it up, but having no idea just how critical her decision will be in proving someone’s innocence. Learn more on the official page for The Vanished Note. From Anonymous of Indio, California on 9/12/2015 . Wonderful short story showing the importance of always doing the right thing. Story of God's Providence, You Will Like This One! From Family of 13 of Dryden, Virginia on 11/2/2014 . Our family recently enjoyed the Vanished Note one quiet Sunday afternoon. Though it differed some in quality and length we were blessed by the way the Lord's providence is beautifully woven throughout it in a way that encourages listeners (which in our family is 13 listeners,) to better appreciate our great God's gracious providence. We especially appreciated the encouraging examples of the young husband's God-fearing leading of his wife and the wife's noble character in following his leading even when it meant making the difficult choice of esteeming others over their own needs. We appreciated how this was rewarded in the end, and felt encouraged to live a life of honesty and integrity before the Lord, knowing that we will be blessed for it. From Anonymous of Norton, Ohio on 9/12/2014 . With so few good role modals these days, these stories can help teach some much needed morals. From Lizette Williams of Apison, Tennessee on 8/28/2014 . Excellent. Thank you for always creating moving opportunities for our kids to see how God works in people's lives. From Vanessa Pauls of Atascadero, California on 2/16/2014 . This audio was as excellent as all the other Lamplighter productions I've listened to. Thank you so much for such a great product!